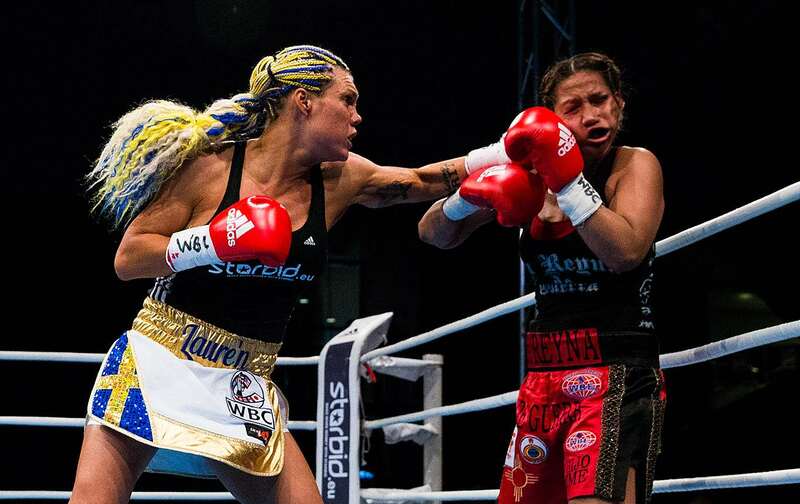 Lauren retained the WBC title, and added the UBF (!) bauble to her Collection (which now read five belts). Cisneros was a late sub for Hanna Gabriel and came in on a week´s notice. She took a beating in every round as Lauren landed with almost at will and referee Guido Cavalleri correctly called it off with Cisneros against the ropes with a nosebleed and under pressure but not hurt. Fabretto was much stronger and floored his opponent twice with knockjabs before it was stopped. 40-36 on all cards. Saleh dominated the fight with Seliga trying hard throughout. 38-38 twice and 39-37 for Björklund after a messy fight where both switched stance but was seldom effective. WBO Youth title. 99-89, 96-92 and 97-91. Ludwiczak had a point docked in the fourth for an elbow and was floored in the fifth. Gjergjaj won the vacant EE title on scores of 116-111, 117-111 and 115-112. Gjergjaj was down in the fifth and hurt his right hand in the fifth. An upset looked likely but Gjergjaj found the range for his left and Bakhtov faded somewhat. Uzun won the GBC title in scores of 116-112, 117-111 and 114-114 and got revenge over Jatta. 95-93 on all cards, two for Muller, one for Masternak. Muller was down in the fifth and seventh and most felt Masternak had won. vacant PABA and WBO Oriental titles. Gigel, born 1988, made his prodebut. This was a tribute show to the late Alex Vistine. Beaussire won the vacant French welter title on scores of 98-92 twice and 95-95. Leonet retained the French title. Kolaj won the vacant Italian lightheavy title on scores of 97-91, 96-93 and 96-94. Gonzales won the Spanish superlightweight with a hardfought stoppage win over capable veteran Mendoza. Morales won the vacant Spanish lightweight title on scores of 97-95 and 96-95 twice. 59-56 and 58-57 for Garcia and 58-57 for Telemanou. 59-56 Velez, 57-57 and 58-56 for Soria. Kasperski won the French lightheavy title on scores of 96-94 on all cards - a decision that left Bois furious but he acknowledged he hadn´t worked hard enough. 77-76 and 79-74 for Sargsyan and 78-76 for Korobko.